Operating and maintaining an airport is a little like owning a house. There is always something to fix or upgrade. Boeing Field first became an airport in 1928, and is one of the oldest airports in the nation. This also means it has some of the oldest infrastructure of any airport in the nation, and as with an older house, updates provide some unexpected challenges. Repairs to the asphalt runways and taxiways were completed until a major replacement of pavement could be scheduled for 2005. Perhaps the most critical infrastructure to any airport is the runway and taxiway systems. The primary runway at Boeing Field is Runway 13R/31L, and it was last upgraded almost 20 years ago, in 1985. The last upgrade covered the original concrete runway with an asphalt overlay, which provides a good upgrade to a runway’s surface. However, asphalt is actually a flexible pavement that depends largely on the strength of the base materials for support. Asphalt also becomes more brittle over time. This generally poses no problem as long as the base of the materials is stable. 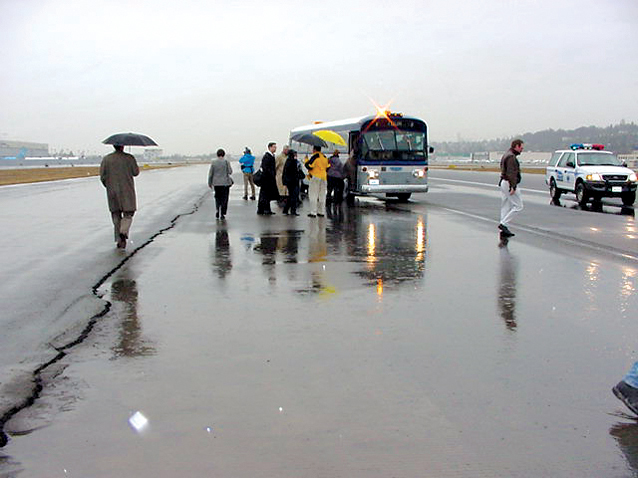 During the 2001 Nisqually earthquake, the runway base materials were rearranged and demonstrated that there were pockets of weak sub-base materials. 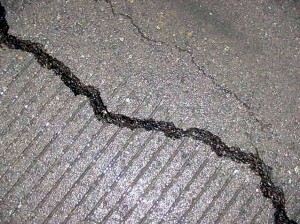 The earthquake caused liquefaction of the sub-base soils resulting in significant cracks, subsidence of the pavement’s surfaces, and changes to the longitudinal profile of the runway. The immediate action following the earthquake was to return the pavement surface to a serviceable state to permit full use by aircraft as quickly as practical. Immediately following the earthquake, the airport and Federal Aviation Administration began to prepare for a complete rehabilitation of the airport’s primary runway. This upgrade is currently under design and is scheduled for construction in 2006. The runway rehabilitation will include subsurface drains to further stabilize the base materials and will install a new asphalt surface. The Bravo taxiway also experienced a similar impact from the earthquake and has a similar history. The earthquake and the age of pavement have resulted in some ponding and rutting along the wheel tracks. The airport and FAA are planning an upgrade to the Bravo Taxiway in 2007. More background and a more detailed project description on this project can be found in a previous article (Pacific Northwest Aviation & Business Journal, October 2004). Everyone likes to keep their feet dry, and to ensure this the airport just completed a needed upgrade to one of KCIA’s stormwater pump stations. Six old pumps were replaced with four high efficiency pumps and new pump controls were installed. Some of the replaced pump controllers were originally installed in 1938, and had long served their purpose. In a similar effort to stay dry, the airport recently replaced two roofs including a new roof on the control tower. These are larger projects but the airport maintenance staff also constantly works to extend the life of buildings through preventative maintenance and smaller repair projects. Deciding when to invest in a major upgrade to a roof or a runway or repair the existing system is always a balancing act. The objective is to optimize the airport’s investments to get as much life as possible out of the existing system before implementing a costly upgrade. Ideally, like every homeowner, we would like to replace a roof the day before it would begin to leak or rehabilitate a runway just before the last plane is to land. Keep in mind the next time you need to perform or pay for a home repair, that the same challenges face an airport. With a little luck and some careful planning, we can all stay dry and be ready for the consequences when Mother Nature sends inclement weather or incidents our way. The main KCIA runway was inspected by experts to determine the solution to catastrophic cracks in the pavement following the Nisqually earthquake.